We all hope that when it comes to your wedding day, that the weather will be sunny and dry. You’re looking your best, you’re wearing a stunning dress (or suit, fellas), your hair is looking superb and your make up is on point. The last thing we want is want. In the run down to any wedding we all think the same thing: “what will the weather be like?”. I’m sure if there was a day in the year that guaranteed good weather, that would be the most booked day for weddings! Here in the UK the weather is so unpredictable that even if you’re fortunate enough to book your wedding for the last week in July, it’s still not certain that you’ll get good weather for the day. A key factor when it comes to the weather for a wedding day is photographs. Being able to take a photo in a beautiful surrounding that you’ll have for years is something that we all want to have, so we’re going to show you some of the best wedding photography ideas for rainy days that we’ve seen, so you can still get that perfect shot in imperfect weather. 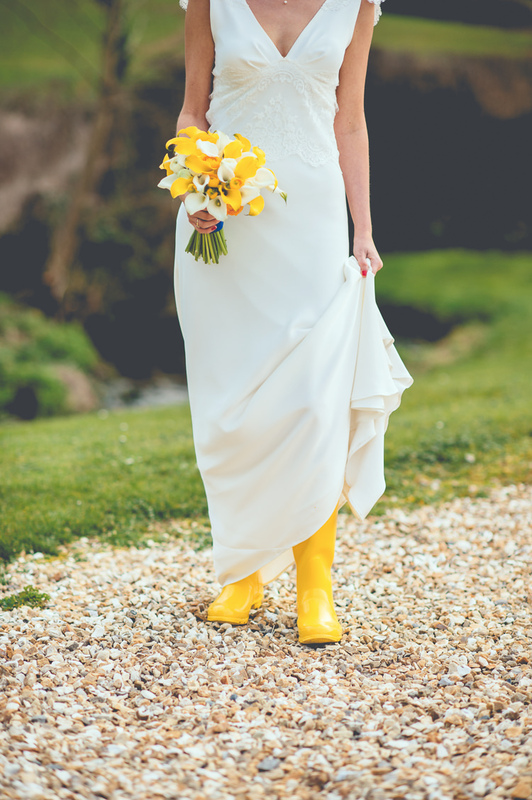 Use the weather to your advantage and add some fun and colour to your photographs by wearing wellies. The good thing about wellies is that you can get them in all colours, so you’ll find some that match your theme easily. Don’t try and hide them, rock the wellies and show them off! 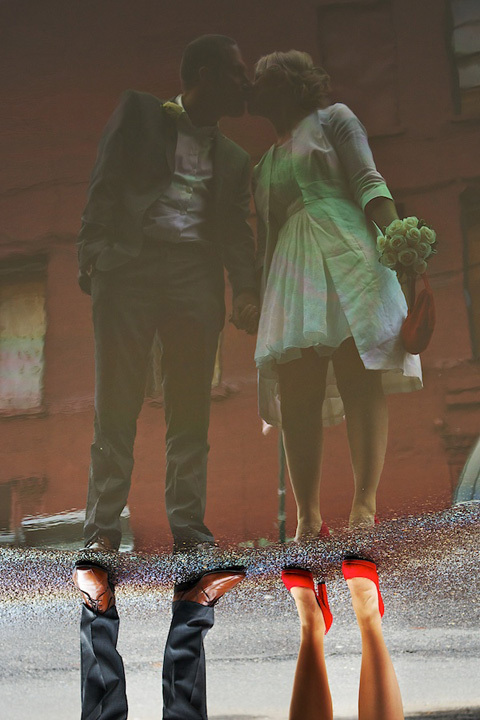 The wellies add creativity to your pictures and something different too. Don’t be afraid to get some wellies on, get on the wet ground and show them off. On any given rainy day, an umbrella is a go-to. So why not for your wedding day? 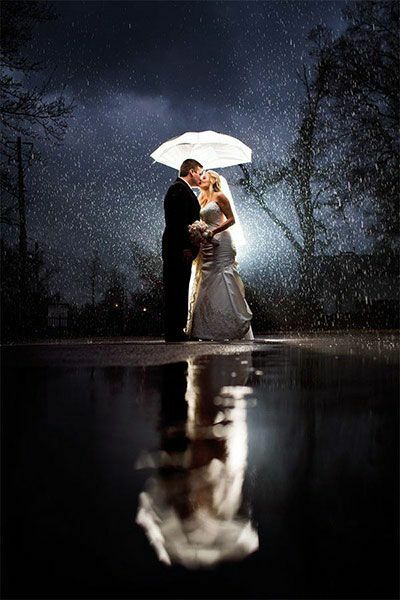 An umbrella can be a great accessory to have for your wedding photographs on a rainy, if you use it properly. 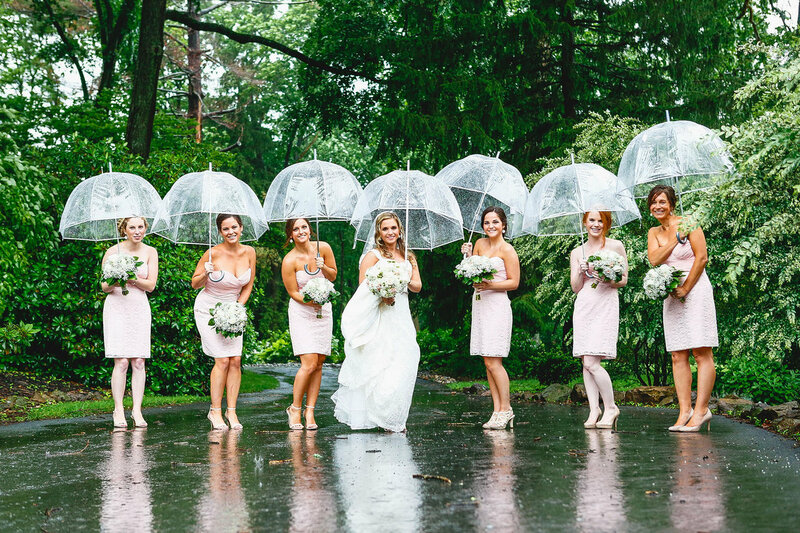 Here are some stunning examples of how people have used umbrellas to get some beautiful pictures on their wet wedding day. When used well, an umbrella adds an extra dimension and touch of class to your photographs. Get hold of one, just in case. Find a Puddle. A Big One. 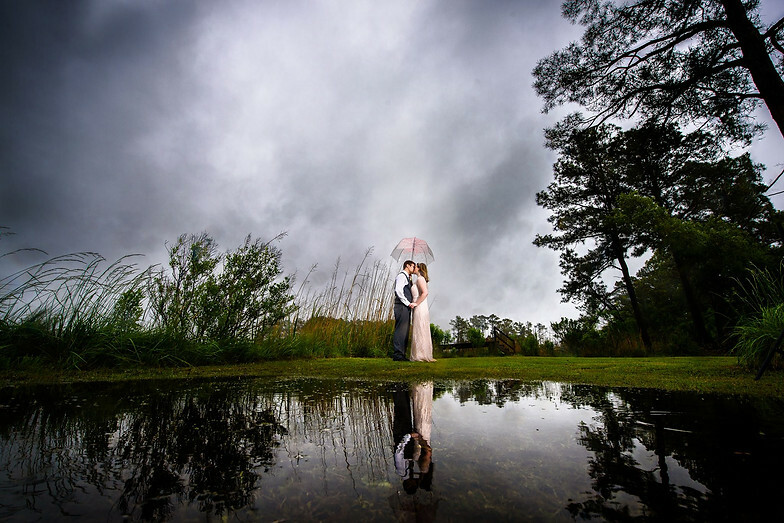 This is one that might not have immediately sprung to mind when you think of wedding photography ideas for rainy days, but this is an awesome ideas that looks great when executed properly. Using natural reflections in pictures is becoming more and more popular. Yes, in an ideal world we’d all like to have a wonderful picture outside, but if the weather gets really bad, don’t be afraid of heading indoors to get some shots. Barns and older rustic buildings can make great backdrops for a wedding shoot. If you’re having a vintage style wedding, make the most of the venue and use it to your advantage if going outside just isn’t doable. As you can see, these couples got stunning shots without being outdoors. If you’re completely washed out, heading in doors and staying dry could be a great option. Don’t be afraid of heading for cover. With the right lighting and an open attitude, you can get some amazing photos in poor weather conditions, and even make the weather work for you! We’ve noticed that the lighting behind the couples works really well, so bear that in mind. I hope you’ve found these wedding photography ideas for rainy days useful, why not try a few on your very own big day?! Weddings are awesome occasions; getting your friends and family together to celebrate one of the biggest and happiest days of your life is something to be remembered. As expected, weddings take a lot of thought, planning and effort, and with that comes the need to spend money. According to bridgemagazine.co.uk the average cost of a wedding is £30,111 – that’s a fair bit of money! Like any purchase, we can save money on weddings, but exactly how do you cut costs when planning a wedding and not lose any of the grandness or any of the features that you want on your big day? One of the first tips you’ll see when looking to save some money on a wedding is ‘cut your guest list down’, but you want every to be there, right?! So we’re going share a few tips that we’ve picked up that can help you save a bit of a bit money and cut costs when planning a wedding and keep your guest list too. During ‘peak times’ in the summer months, the cost of venue hire is significantly higher than from November to March (excluding Christmas). If you’re happy to put up with a bit of chill and book a winter wedding, you can save up to £30-40 per head on guest prices and BridalGuide.com suggest that holding a wedding in January can save you approximately 25% on venue costs. Not only will a winter wedding save you money, the decor and styling you can use for a rustic, winter theme is a big pull for many people and allows you have a loads of fun with planning and designing your theme. Following on from avoid summer time for your wedding, you can cut further costs when planning a wedding by having your wedding on a Sunday or in the week. This follows the rule of supply and demand, with Saturday weddings being the most popular day by far, there’s less demand for a week day, even a Sunday wedding, therefore you can save money by going for the one of those days. 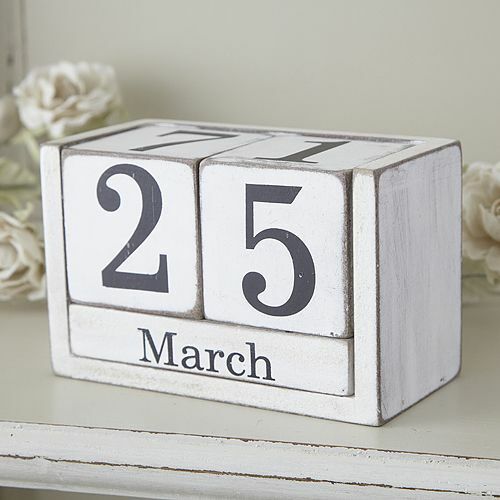 The estimated savings for getting married on a weekday amounts to thousands of pounds. This means that you cut down on the cost without having to reduce your guest list. Bonus! Here’s another way that you can save money, but also personalise and customise your wedding with something unique to you. Wedding invitations aren’t the most expensive thing you’ll buy in the lead up to your wedding, but by making your own you can save money. If you have the time, designing and creating your own invitations is a fun activity and adds a little bit of sentimental value to your one-of-a-kind invitations. This also gives you complete control and allows you to make your invitations exactly how you want them, at a fraction of the price. Much like invites, flowers aren’t the biggest spend, but the cost quickly does add up. You can save money on flowers though just by following a few simple tips. Importing bouquets from overseas will quickly take the cost of your flowers up. Buy in season flowers from local sources to keep the cost down. Rather than buying flowers for your top table, use your bridal party bouquets. You’re going to have to put them down when you’re at the table anyway, so why not use them as your centerpiece? This is a quick floral-win when looking to cut costs when planning a wedding. Using greenery rather than blooms will also save you money. Plants such as ivy are cheap (free if you’re happy to go find some yourself!) and rustic style to your decor. Don’t be afraid to shop in the sales for dresses and suits for your bridal party. Just because you don’t pay full price for something doesn’t mean you’re sacrificing quality or style. Keep an eye out for sale items that could save you hundreds of pounds but still have your party looking amazing. Don’t forget to look at the costs between hiring and buying, especially when suit shopping. Prices vary between between retailers, so make sure to ask when you’re looking around. The great thing about buying a suit or dress is that you can keep it and wear it again for other occasions, giving you even more value for money. Why Hire a Sweet Cart for Your Wedding? If you’ve been browsing through the website, you’ll already know how Sweet Trolley Hire came into being and how myself and Rob managed to find ourselves with our beautiful sweet cart for our own wedding. If you don’t, you can check out my About page and find out our story. So you know who I am and why I do what I do, but thought it would be fun to tell you why I do what do it and give you a few reasons why we wanted a wedding sweet cart for our own special day. Planning a wedding is tricky with so much to think about and so much to plan. We can often get caught up in the dresses, venue hire, cars, photographers and suits that the little details can sometimes slip to the back of your mind, but it’s the small details that can make a huge difference. Wedding favours are ones of those little details that go a long way. Often when discussing a wedding, guests will mention the favours as it’s something that can be taken away and remembered. Letting your wedding guests pick their own pick & mix to take home is a win-win for everybody. You know that they’re going to get something they enjoy as they can choose and be selfish with what they like, but also it saves you time because, in essence, they create their own favours (and when planning a wedding, time is one of your best friends). So you’ve sat through the speeches and you’ve eaten a beautiful meal, which has probably gone down an absolute treat! From weddings I’ve been to in the past, when it comes to sharing out the cake, many guests are still full from the meal. A wedding sweet cart is a creative alternative that allows your guests to enjoy a lighter snack and then have a piece of cake later on, or take some home to enjoy the next day. Or if your guests are anything like ours were, they’ll enjoy plenty of both! A sweet trolley still isn’t that much of a common feature at weddings. It gives you something different, but offers something for everyone to enjoy that will make your wedding stand out, giving your guests an extra talking point when remembering your day. Our guests absolutely loved the sweet cart, taking pictures of it, telling us how much they like the idea and then encouraging us to hire it out! It really did give an extra dimension to the day. So I just said that your sweet cart will be a talking point already, but it really is another point for your guests to socialise and talk together. Much like a bar area where guests will stand together and chat as they order their drinks, a sweet cart gives guests another chance to catch up, talk and discuss the day as their picking which sweet to have. A vintage wedding sweet cart not only looks great in its own right, but it adds to the style of your day, bringing an extra dimension to your wedding day. My cart has been neutrally decorated so that it suits any colour theme, and I’ll also decorate it with bunting that complements your styling and decor. Weddings are great, I absolutely love them, but they are long days – especially when you don’t know what’s coming next! With a sweet cart, you give your guests something different to look forward to. Everybody knows there’s a dance to look forward to in the evening but your guests’ eyes will light up as they walk into your venue and discover a retro sweet stall waiting for them to enjoy later on! So there you have, now you know why Rob and I wanted a sweet cart, and why we offer it to others looking to tie the knot as well. I love our sweet cart and I’m sure you and your guests will too!